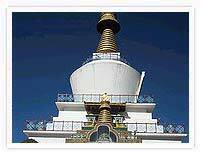 Meet on arrival and transfer to hotel, assistance by our representative through the beautiful valley of Paro.Paro is famous for its Paro Dzong overlooking the Paro Chu (river) and TaZong formerly was a watch tower turned to a national Museum. The Paro Village was constructed in 1985, it has the only Airport in the country. Paro Dzong is the administrative seat of Paro district and home of monks. 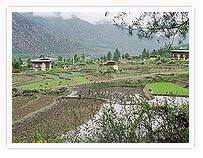 The Paro valley dominated by Monsoons and the average temperature ranges from 15-20 degrees. While flying to Paro from New Delhi, on a clear day you can witness the Great Himalayan peaks like Everest, Kanchenjunga, Makalu, Chomolhari, Jichu and tserimgang etc.Evening walk through the local market to explore the Bhutanese Handicraft. Antique, Tangkha paintings textiles etc, overnight at Hotel. After breakfast Sight seeing tour continues to Paro valley visit to Drukgyel Dzong a ruined fortress, dome of Chomolhari the mountain goddess. Visit to Kyichu Lakhang one of the old temples built by king Sonsten Gampo,it was considered as the mark of arrival of Buddhism in Bhutan. Visit to National museum earlier known as Ta Dzong a watch tower. After lunch walk down the trail to visit Rinpung Dzong ("fortress of the heap of jewels"), along the wooden galleries lining the inner courtyard having fine wall paintings demonstrating Buddhist teachings.In time drive to Thimpu. Arrival and check in to hotel. After breakfast proceed to tour of Thimpu the capital town of Bhutan. Visit National Library, housing an extensive collection of priceless Buddhist manuscripts, The Institute of Traditional Medicine, and Institute of Zorig Chusum (Painting school).After lunch, visit Tashi chho dzong, "the fortress of the glorious religion". This is the seat of political and religion power built by the unifier of Bhutan, Shabdrung Ngawang Namgyal.Reconstructed again by the third king his majesty Jigme Dorji Wangchuck 'the father of modern Bhutan' Visit to government-run Handicrafts Emporium, local crafts shops to witness through the rich and flourished culture of Bhutan's fine traditional Arts, hand woven textiles, Tangkha paintings wooden carvings and jewelry. In time drive to Paro to board flight to onward destinations.